Mark Miller is President and Chief Executive Officer for the Cascade Engineering Family of Companies, comprised of nine business units supporting a wide diversity of markets including transportation, environmental services, agriculture, commercial products, material handling, polymer compounding, and RFID asset management. Mark joined Cascade Engineering in 2006 as Vice President of sales and marketing for CK Technologies (CKT). He was named President and Chief Operating Officer for CKT in 2007. In 2009, Mark was named Senior Vice President of the Transportation Group, comprised of CK Technologies and all automotive operations in the United States and Europe. 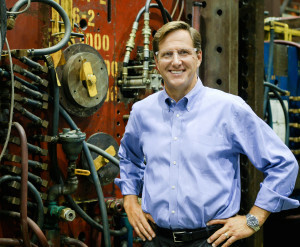 He was named President of the Cascade Engineering Family of Companies in 2013 and CEO in 2014. Mark is responsible for leading 1,600 employees located in 15 facilities throughout the United States with European operations in Budapest, Hungary. Mark guides the organization’s strategy for continued growth and strong financial performance across all business platforms. Prior to joining Cascade, Mark spent over 20 years in the transportation industry. His extensive industry experience has included working with virtually all major OEMs in both the commercial truck and automotive sectors. Born and raised in Detroit, Mark began his career with Ford Motor Co. in finance. Mark holds a bachelor’s degree in finance from Wayne State University. He and his wife, Diana, have three children and live in Spring Lake, Michigan.